The surface of the earth is a complex zone. It can be divided into three main portions, viz. lithosphere, atmosphere and hydrosphere. Lithosphere: The solid portion of the earth is called lithosphere. It is composed of rocks of the earth’s crust. There is a thin layer of soil on top. The soil contains mineral nutrients which sustain various organisms. Atmosphere: The thick envelope of air surrounding the earth is called atmosphere. The atmosphere is about 1600 km thick and is composed of various gases. Hydrosphere: The hydrosphere is composed of water. Water is available in all three states on the earth. About two-thirds of the earth’s surface is covered with water. The earth’s surface can be divided into two main parts, viz. the continents and the ocean basins. Continents: The huge landmasses on the earth are called continents. Ocean Basins: The huge water bodies on the earth are called ocean basins. All the oceans of the world are connected to each other. Due to this, the level of sea water is same everywhere. Elevation of land is measured from the sea level and the sea level is taken as zero. Mount Everest is the highest peak on the earth and it is 8,848 m above sea level. On the other hand, the Mariana Trench (in the Pacific Ocean) is the deepest place on the earth and is 11,022 m below the sea level. There are seven continents and all of them are separated by large water bodies. The seven continents of the world are; Asia, Europe, Africa, North America, South America, Australia and Antarctica. A greater portion of the landmass lies in the northern hemisphere. This is the largest continent. Asia covers about one-third of the total land area of the earth. This continent lies in the eastern hemisphere. The Tropic of Cancer passes through Asia. The Ural Mountain separates Asia from Europe in the west. The combined landmass of Europe and Asia is called Eurasia. Europe lies to the west of Asia and is much smaller than Asia. It is bound by water bodies from three sides. The Arctic Circle passes through Europe. Africa is the second largest continent. The major portion of Africa lies in the northern hemisphere. This is the only continent through which three major longitudes pass. The equator, the Tropic of Cancer and the Tropic of Capricorn pass through this continent. The equator passes almost through the middle of Africa. The Sahara Desert is the largest hot desert of the world and it is in Africa. World’s longest river, the Nile, is in Africa. Africa is bound by water bodies from all sides. It is the third largest continent. North America and South America are connected to each other by the Isthmus of Panama. Isthmus: A narrow strip of land which joins two landmasses is called isthmus. North America lies in the northern hemisphere and western hemisphere. North America is surrounded by three Oceans, viz. the Atlantic Ocean, The Pacific Ocean and the Arctic Ocean. A major portion of South America is in southern hemisphere. This continent is surrounded by two oceans, viz. 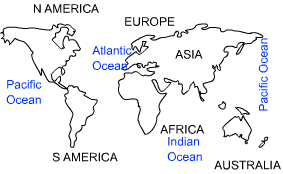 the Atlantic and Pacific oceans. Andes; the longest mountain range in the world is in South America. World’s largest river; the Amazon is in this continent. This is the smallest continent. It lies entirely in the southern hemisphere. Since Australia is surrounded on all sides by ocean hence it is called the island continent. This is a huge continent and is present on the South Polar Region. In fact, the South Pole lies at the centre of this continent. There is no human settlement in this continent. However, many countries have made research centres in this continent. Maitri and Dakshin Gangotri are the research centres set by India.